Amrita Rao bowls Harbhajan Singh over! Bollywood actress Amrita Rao and cricketer Harbhajan Singh pose for pictures during a promotional event for a sports television channel in Mumbai on Tuesday. The function was held to mark the beginning of the cricket season on the channel. 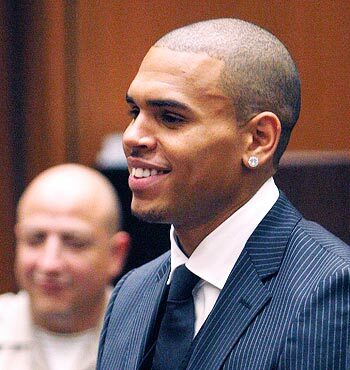 Singer Chris Brown smiles during his sentencing in Los Angeles on Tuesday. Brown was sentenced to five years' probation and 180 days of community labour by an LA judge, under a plea deal worked out for an assault on his then-girlfriend, pop singer Rihanna, earlier this year. 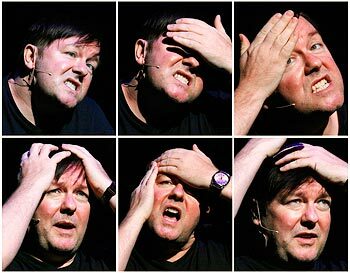 Combination image shows British actor and comedian Ricky Gervais gesturing on stage during a photocall for his upcoming show at the Edinburgh Fringe Festival, at the Edinburgh Playhouse in Edinburgh, Scotland on Tuesday. Koena Mitra, now just a click away!